Starting on August 31st, Taco Bell is giving away over 5,000 brand new Xbox One X. 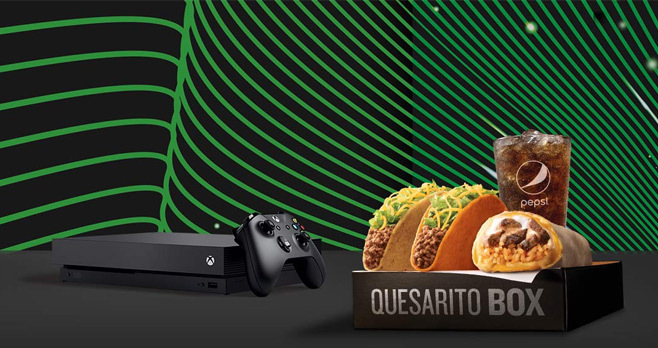 Enter the Taco Bell Xbox One X Contest 2017 and you could win yours too. For a chance to win the Taco Bell Xbox Giveaway, purchase any $5 Box to get a code. Then, enter your game code online at either TacoBell.com/Xbox or WinXbox.com. There’s a new winner about every 10 minutes. Over $2,000,000 in prizes. The Taco Bell and Xbox Game is offered only to legal residents of the 50 United States and the District of Columbia who are at least 18 years of age at the time of entry. The Game begins at 12:00 AM ET on August 31, 2017 and ends at 11:59:59 PM ET on October 4, 2017. During the Game Period, purchase a specially-marked Taco Bell Box from a participating Taco Bell restaurant and you will receive one Code printed on the Taco Bell Box. Between September 22 and October 4, 2017, you may click here and follow the on-screen instructions to obtain a free entry code. Upon obtaining a Code, you may play the Game by sending a text message to 72823 with a valid Code or visit www.winxbox.com to enter a valid Code to find out if you are a winner. Regardless of how many Codes are obtained by an entrant, the method used to acquire the Codes, or the method of Game Play, there is a limit of one Game Play per entrant per day during the Game Period. Upon completion of the Game Play, the entrant will either receive a Game Notification on the Website screen or a notification text as to whether or not he/she is a potential winner. one (1) three (3)-month subscription to Xbox Game Pass. The total number of prizes awarded in the Game will not exceed 5,040. The ARV of each prize is $589. The total ARV of all prizes available in the Game is $2,968,560. For a list of winners, mail a self-addressed, stamped business size envelope to: Taco Bell and Xbox Game Winners List Request, P.O. Box 251328, West Bloomfield, MI 48325. Requests must be received by December 5, 2017. I have been ordering Crunchwraps for a long time and have enjoyed them every time! I am a 83 year old person and hope to enjoy them as long as I can. Hopefully Taco Bell will continue them during my live time. Thanks for a great meal !!!! I want to win cuz my mom smashed my last one cuz she was mad at my brother ?? ?.